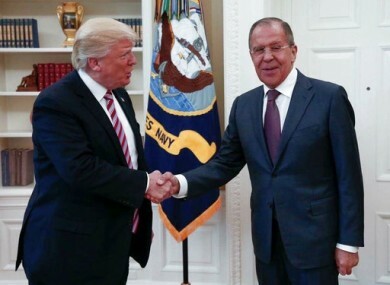 Handout from Russian Ministry of Foreign Affairs shows President Donald Trump meeting with Russian Foreign Minister Sergey Lavrov in the Oval Office of the White House. US PRESIDENT DONALD Trump has defended his sharing of information with Russian diplomats, following the news that he had divulged highly classified secrets to officials during a meeting last week. The Washington Post reported yesterday that Trump had shared details about an Islamic State terror threat related to the use of laptop computers on aircraft with Russian Foreign Minister Sergei Lavrov and Russian Ambassador to the US Sergey Kislyak during a meeting at the White House last week. Three White House officials who were in the 10 May meeting strongly denounced the story, saying no intelligence sources and methods were discussed – but they didn’t deny that classified information was disclosed. This morning, Trump appeared to defend his sharing of information with Russia, saying he had “the absolute right” to share “facts pertaining to terrorism and airline flight safety”. The US president made the statement on Twitter. “As President I wanted to share with Russia (at an openly scheduled W.H. meeting) which I have the absolute right to do, facts pertaining to terrorism and airline flight safety,” Trump tweeted. Humanitarian reasons, plus I want Russia to greatly step up their fight against ISIS & terrorism. The anonymous officials told the Post that the information Trump relayed during the Oval Office meeting had been provided by a US partner through an intelligence-sharing arrangement. They said it was considered so sensitive that details have been withheld from allies and tightly restricted even within the US government. The news that Trump had shared information during his meeting with the Russian diplomats had garnered strong criticism from Democrats and Republicans alike. Earlier, White House officials had attempted to rubbish the story. “I was in the room, it didn’t happen,” H.R. McMaster, Trump’s national security adviser, told reporters outside the White House late last night. “The president and the foreign minister reviewed a range of common threats to our two countries including threats to civil aviation,” McMaster said. At no time, at no time were intelligence sources or methods discussed and the president did not disclose any military operations that were not already publicly known. He said Secretary of State Rex Tillerson and Dina Powell, deputy national security adviser for strategy, remember the meeting the same way. “Their on-the-record accounts should outweigh those of anonymous sources” in the news report, he said. He said that during that exchange the nature of specific threats were discussed, but they did not discuss sources, methods or military operations. This story is false. The president only discussed the common threats that both countries faced. The Post story – which was later confirmed by The New York Times and BuzzFeed News – does not claim that Trump revealed any specific information about how the intelligence was gathered. Still, it will only heighten Trump’s strained relations with intelligence workers and former officials, who view Russia as an adversary. Even before he was inaugurated, intelligence professionals worried about sharing classified information with Trump, who often shoots from the hip. If true, the breach was ill-timed, coming a day after Trump fired former FBI Director James Comey, who was leading an investigation into Russian meddling in the presidential election. Trump’s first national security adviser, Michael Flynn, was fired after he misled Vice President Mike Pence about conversations he had with Kisylak. It’s unlikely that Trump has broken any law. As president, Trump has broad authority to declassify government secrets. The Post said the intelligence partner had not given the United States permission to share the material with Russian officials. By doing so, Trump would have jeopardizsd cooperation from an ally familiar with the inner workings of the Islamic State group, and make other allies – or even US intelligence officials – wary about sharing future top secret details with the president. The CIA and the Office of the Director of National Intelligence declined to comment yesterday evening. GOP Sen. Bob Corker of Tennessee, chairman of the Senate Foreign Relations Committee, told reporters the Trump White House “has got to do something soon to bring itself under control and order”. “The shame of it is there’s a really good national security team in place and there are good, productive things that are under way through them and through others,” Corker said. But the chaos that is being created by the lack of discipline — it’s creating an environment that I think makes — it creates a worrisome environment. Sen. John McCain, R-Ariz., chairman of the Senate Armed Services Committee, said that if the story is true it would be “deeply disturbing”. The controversy engulfed the White House. Reporters spent much of the evening camped out outside of Press Secretary Sean Spicer’s office, hoping for answers. At one point, an eagle-eyed reporter spotted a handful of staffers, including Spicer and Deputy Press Secretary Sarah Huckabee Sanders, walking toward the Cabinet Room. Email “Trump says he had 'absolute right' to share information with Russians”. Feedback on “Trump says he had 'absolute right' to share information with Russians”.